if you have something new to add to your profile, click here. to unsubscribe, click here. All Rights Reserved 2014 © Tigerair ARBN 119 900 757/CRN 200312665W. book by midnight aest thursday. 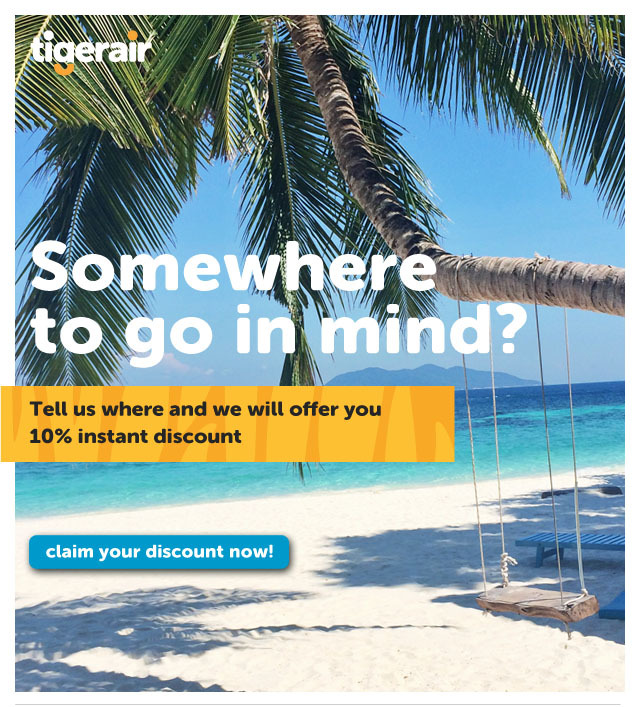 jump on the tigerair website for details. #"Light" domestic fares are the lowest available single price, regular fares from Tigerair Australia for one-way travel with hand luggage only and are fully inclusive of all taxes and charges. "Sale" domestic fares have the same inclusions as "Light" domestic fares except that "Sale" domestic fares have limited availability and extra low fares. All fares are in Australian Dollars. The Booking and Service Fee will not be charged where "Sale" and "Light" domestic fares are purchased online using a MasterCard debit card issued by an Australian financial institution. Conditions apply. Click here for details. Travel periods vary by route, please click here for details. Buy between 08/07/2014 and 10/07/2014 , or until seats sell out.